I love Christmas. Every year, as we binge on leftover stuffing and pie, I start to get excited, complete with unstoppable grins and the I-can’t-sleep jitters. The smells and the lights and the gatherings and the secrets—there’s magic in the holidays. I was raised in an incredibly Catholic family. I attended 12 years of Catholic school, and then, for good measure, I spent two years at a Catholic university. My aunts still wear buttons that remind passersby to “Keep Christ in Christmas!” and we get plenty of holiday cards bearing images of a blue-clad woman and a blond baby surrounded by farm animals. I’m no longer Catholic. I’m no longer even Christian. I fall squarely into the agnostic camp, and I’m quite happy to stay there. But this holiday, this time of year, the traditions of carols and decorations and cookies and gifts—I love it all. I admit that I’ve participated in the buying frenzy that has come to represent the holiday in this country. I’ve let Santa bring big gifts. Granted, they tend to be big family gifts, supplemented with new pajamas, a few small gifts, and a stocking full of candy and toothbrushes for each kid (the toothbrushes are a thing inherited from my own Santa, who often added necessities like razors and deodorant to our stockings). Last year, the man in red brought an electric piano for the family and new art supplies for each of the kids. I’ve justified our participation in the consumption as a balanced over-the-top, one that lets the kids get excited about the holiday and even the gifts without developing an insatiable greed for the latest and greatest. And it seems to have worked. 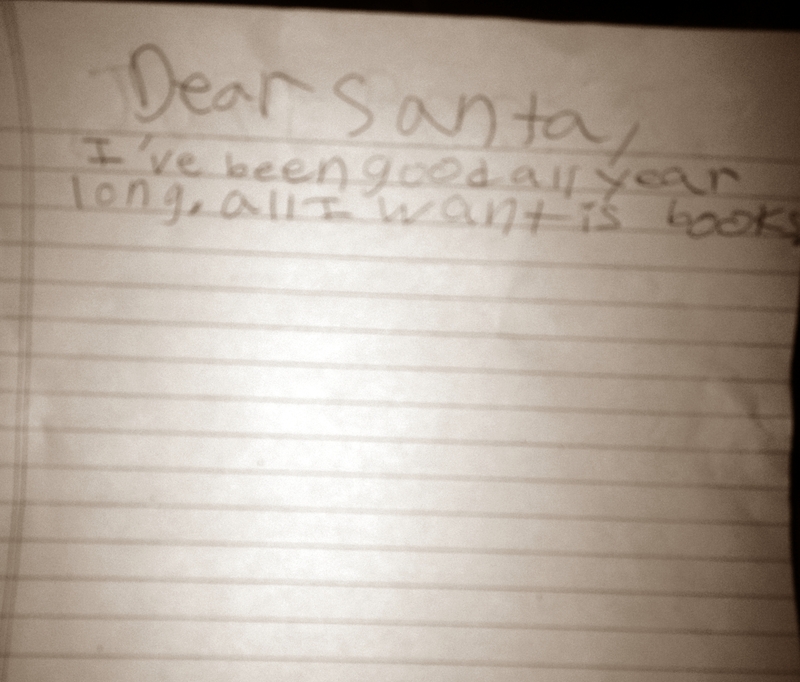 My seven-year-old’s letter to Santa asks only for books. My eight-year-old wonders what the big family gift will be this year. No one has made a list that includes a dozen over-priced electronics and gewgaws. And so, there will be no electric pianos under this year’s tree. Instead, we’re aiming for a no-buy holiday. We’re sure to stretch the definition of “no-buy,” particularly given the magic we want to maintain for the little guys who still believe that Christmas Eve brings the big guy. But our wallets are finite, and as I watch the sun rise in a saturation of navys and fuschias and I hear a boy starting to stir in his bedroom, I am reminded that the most wonderful things about this holiday are not the things, but the people and the experiences. I’m setting some ground rules. Stay tuned for how we go about accomplishing our no-buy holiday, and feel free to chime in with ideas and suggestions for keeping the crazy under control.